This year, my family are being entertained by the son-in-law for Christmas lunch. He is a good cook but being a young guy, I'm not sure how often he has cooked a turkey for eight people. Maybe some guidance is needed for the young chef cooking a festive bird for the first time. I hope I can help. If you put the turkey in the fridge to defrost, then ensure it is set at 4'C or below and allow 8 to 12 hours per kg of turkey. If in a cool room, which absolutely must be below 17'C, allow 3 to 4 hours per kg. 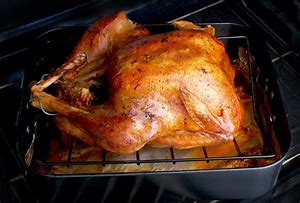 Check that the turkey is thawed by looking inside the cavity for ice crystals and by using the point of a knife to test the thickest part of the meat. What do you do with the giblets? - Cover with water and add a peeled onion, carrot, celery stick, bay leaf and a glass of red wine. Simmer for 40 minutes, then strain and you'll have the perfect stock to deglaze your turkey roasting tin with. Removing the wishbone from a raw turkey makes it easier to carve later, giving you neater slices. Pull back the neck skin until the wishbone is located. Using a small sharp knife, cut through the flesh under the contour of the bone on both sides just deep enough to free it. Then ease out, cutting it free at the tips. 3 kg small turkey - 200C/fan 180c/gas 6 for first 20 mins. Then 180C/fan 160C/gas 4 for next 2 hours. 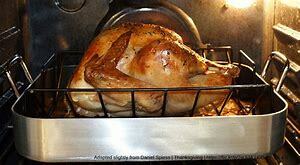 4 kg medium turkey - 200C/fan 180c/gas 6 for first 20 mins. Then 180C/fan 160C/gas 4 for next 2 hours 40 mins. 6 kg large turkey - 200C/fan 180c/gas 6 for first 20 mins. Then 180C/fan 160C/gas 4 for next 4 hours. 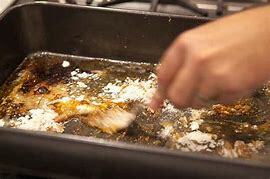 During cooking, make sure that the turkey meat isn't dry and stays moist, by regularly basting it. Any moisture or flavour from butter, bacon rashers or liquid remains on the skin or jut under it and that means that the skin won't crisp up. It’s particularly important that poultry is cooked through. If using a digital thermometer always double check the reading by sticking the probe in several different spots within the thigh or breast, to find the lowest reading. 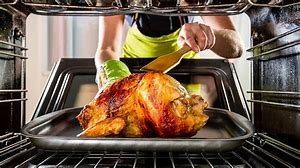 If returning to the oven allow 10-15 mins then test again until the correct temperature is reached, which for turkey is 75-80'C. Without a thermometer, the classic way to test is to push a spoon under the leg of the bird so that it pierces the skin (or use a skewer), and inspect the juices that collect in the spoon. 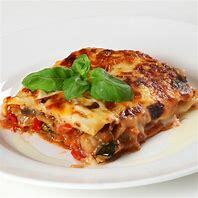 The juices should be pale gold and clear; if there are traces of blood return to the oven, allow 10-15 mins then test again. The leg of a well cooked turkey will wiggle easily when pulled from side to side. However, the breast may be overcooked by this point because it cooks faster, so either use the skewer test or take the temperature. To make sure you get the perfect turkey, leave the bird to rest on a platter so the juices get a chance to settle and run back into the meat. Cover with foil to stop all the heat escaping. Leave for 10 minutes for a small turkey or 20 to 30 minutes for a large one before carving and serving.